I was recently provided the opportunity to review Jooners, an online signup sheet designed to streamline social event planning. I received a premium membership and courtesy swag but the opinions in this review are entirely my own. In case you doubted it. I don't make regular habit out of doing product reviews around here. (Count how many times I've done it. You'll only need one hand.) I receive offers to do product reviews from time to time but the products offered either a.) do not excite me and/or b.) require me to jump through too many hoops to figure out how to use the item correctly to make it worth my while. So I stick to what I know: books. This is, as you know, a book review site. Then, every so often I'll receive an e-mail promo that strikes my fancy and I feel like looking into it a bit more. Such is the case with Jooners, which is an event organizers dream. I could probably become obsessive about using Jooners if I didn't think everyone I know would become a little irritated with me. Easy to use, understand and feel productive with, I'm becoming quite the fan. 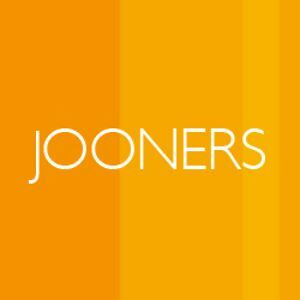 What is Jooners, you ask?! It's a lovely site designed to help you organize and plan events, or make lists of things that need to be done, coordinate meals for others, organize carpooling, plan scout meetings, book clubs, baby showers and/or share assignments. Generally speaking, it's an easy-to-use website which helps you to stay on top of activities and events which involve more people than just yourself. Those of you who know me well know that I am not technologically minded. I resist having to use new programs until forced to do so. One reason I hesitated over the idea of reviewing the Jooners website at first is because I believed it would take me a great deal of time and effort to wade through How To instructions. I envisioned myself sitting at the computer for hours trying to figure out how to download programs and follow more than two directions. I cannot tell you the extent of my relief when I discovered that it took me all of five minutes to set up a FREE account and create my first list. There are suggested formats for showers, class parties, potlucks and any number of other events. Likewise you can create lists to request information from others. Say you are team captain of your son's baseball team and are in charge of collecting uniform sizes. A few clicks of the button and you can shoot an e-mail off to your parents requesting that they hop on Jooners and leave the necessary information for their child's uniform. The visitor's information can be set to private so that the other Jooners guest are not privy to anyone else's personal information making this very handy indeed. There are a lot of ways I can think to use Jooners. Are you a Pampered Chef consultant? Great way to keep track of your parties! A photographer? Great way to keep track of your sessions and send reminders to clients! Home day care providers? There are likely a thousand ways you could use this site! Jonathan and I love hosting large gatherings at our house and we frequently have several families over at the same time and serve meals potluck style. Jooners is a great way to keep track of who is bringing what. Saves on phone time and individual e-mails making sure you have coordinated your meal well! I'm loving it. (In fact, I told Heather that exploring Jooners made me want to throw a big party just so I'd have the immediate excuse to use it!) It makes my organizing/party planning heart a very happy one. Again, one of the great things about Jooners is that it is a FREE service. With a free account you are able to use all of the features available on the site - with a few limits attached. For example, you can create a maximum of five sign-up sheets. You are also not notified when volunteers sign up (so you'll have to log in and look at the information with your very own eyeballs). The complete differences between a free account and a premium account are listed HERE. The happy news at the end of this product review for YOU is that I have TWO premium one-year accounts to giveaway to two of you. These accounts are valued at $49.95. (I also received a premium account in exchange for my review.) Your account will be valid for one year. 1. Leave a comment below. Must include a valid e-mail account for me to contact you at should your name be selected as the winner. 2. Share this giveaway on your FB/Twitter or blog and receive an extra entry. This contest will be open through Sunday, January 14th. THIS CONTEST IS NOW CLOSED. THE WINNERS, as selected by Random.org are #2 - Stephanie and #3 - Mikaila! Congrats, ladies! I do like the sounds of this, though I suspect the standard account would be fine for me.